Long tail chain is also known as long arm chain and Long leg chain! With all these tails arms and legs you would think we are talking about a beast of stitch but it is not the case. Long tail Chain Stitch is a stitch of hidden talents as it is very versatile particularly when you introduce a second process like whipping or if you add beads. Long tail chain is simply a chain stitch with a long tie stitch. It is not difficult to work and is easily added to or arranged in interesting patterns. Bring the needle up through the fabric and insert it back into where it emerged and take a small bite of the fabric to have the point of the needle positioned as illustrated. 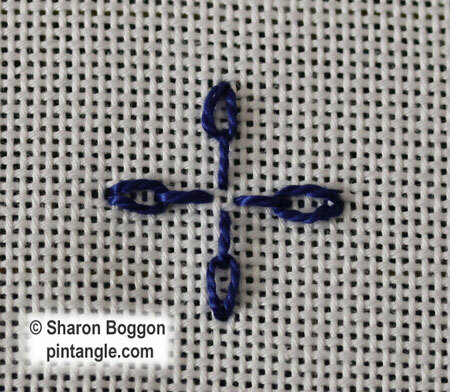 Wrap under the needle point as you would for chain stitch and pull the needle through to create a chain stitch. On the same line tie the chain down with a long straight stitch. 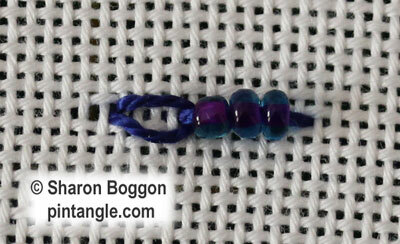 When this stitch is worked in a single unit it is called a long tailed chain. 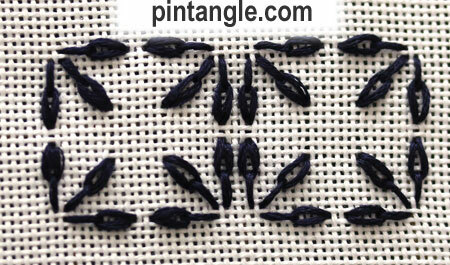 You can arrange long tailed chain stitch is all sorts of ways and I have worked some samples to show you. 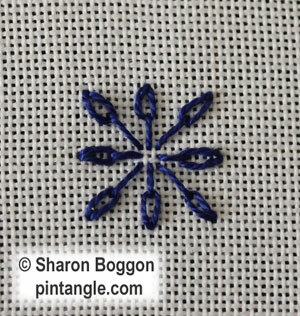 You can even create interesting fills or patterns with this stitch. Circles are a common pattern as they then look like flower petals. Tip! How to work neat stitches in a circle. 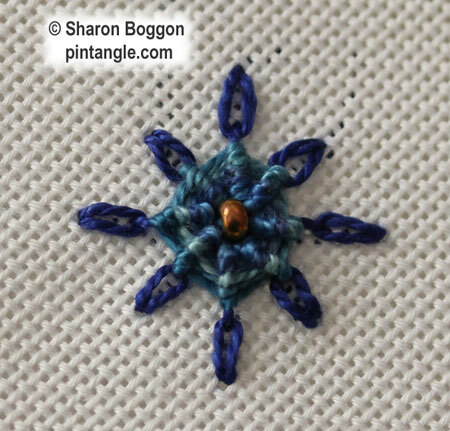 This tip works not only for this stitch but also for detached chain flowers (lazy daisy) bullion flowers and many of the hand embroidery stitches where you have to work a circle of spokes that radiate from the centre. When you work long tailed chain in a circle, imagine a clock face. Work a stitch at 12 o’clock and then another stitch at 6 o’clock then take your thread across the can work a stitch at 3 o’clock and another at 9 o’clock. Next you add a stitch between 12 and 3 o’clock and another between 3 and 6 o’clock and so on. If you do this you will get nicely balanced hand embroidered flowers without having to mark the fabric. 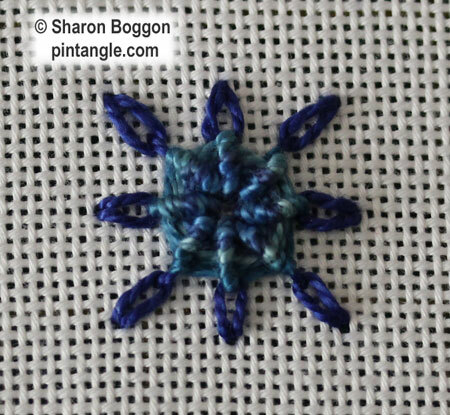 You can create some nice flower patterns with this stitch. 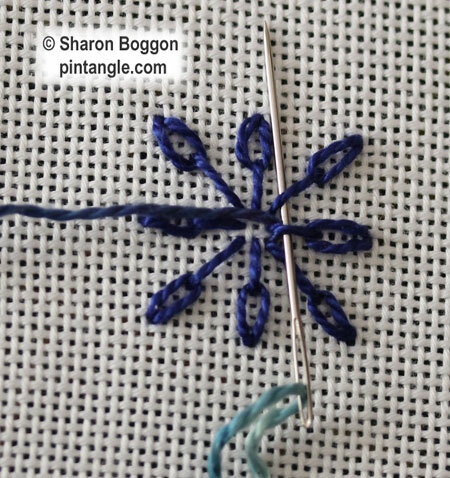 With this stitch the beading is done during the stitching process not added afterward so you need to use a size 26 tapestry needle. 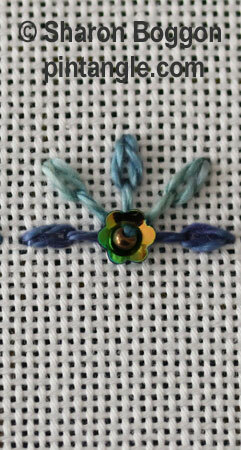 Since the eye of a tapestry needle is long you can thread perle #8 and Perle #5 through the long eye. 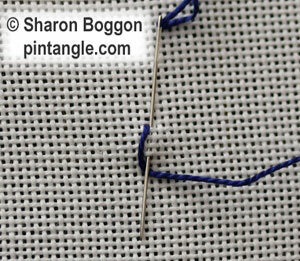 However the needle itself is thin which means you can add a bead to your working thread as you stitch. It is a case of the best of both worlds! To work this beaded version you create a chain and before you tie it off the with the long straight stitch thread 3 seed beads on to the tail. The last variety I would like to share with you is Whipped Long Tail Chain. This stitch is also known as whipped long armed chain, and whipped long tack daisy. 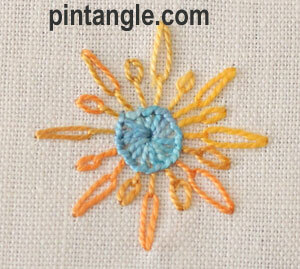 Work 8 long tail chain stitches so that they radiate in circle. 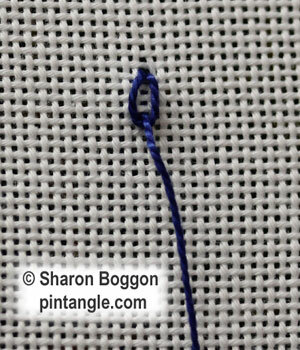 The tails of the stitch are the foundation threads for the whipped stitches. Bring the thread out at the centre and slide the needle under a ‘tail’ and pull it through. 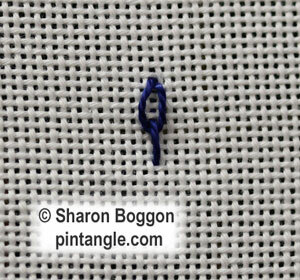 In this stitch you are not going through the fabric just under the long tail stitches which are acting as spokes. Take the thread up and over the top of the spoke and move back a spoke to slide the needle under two spokes as illustrated. Your thread should wrap around the spoke. This whipping action of forward 2 spokes and back 1 spoke is a bit like making a series of back stitches over the spokes but not through the fabric. It is a fun stitch and I hope readers will enjoy experimenting with it a bit. It’s a good and easy stitch. I really liked Annet’s version of the stitch. I like your samples and I’m looking forward to play with it again! 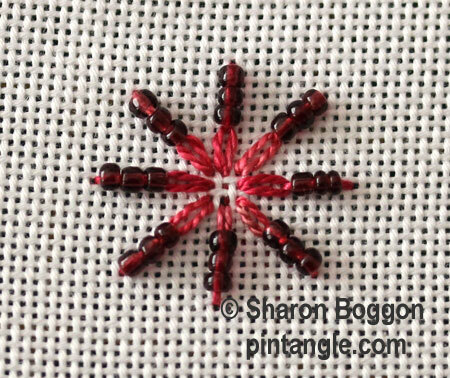 Hi Sharon what a great stitch you can use it so many different ways Thanks for sharing it for us to use. Great stitch! 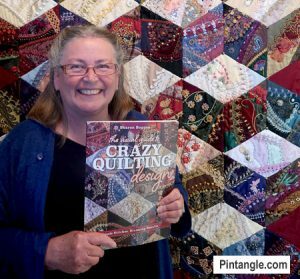 I really enjoyed adding it to my May crazy quilt block. My small samples of 101, 102 & 103 are here. wonderful instructions and samples. I am itching to start this sampler. that will be after my class project and some progress on the hussif. 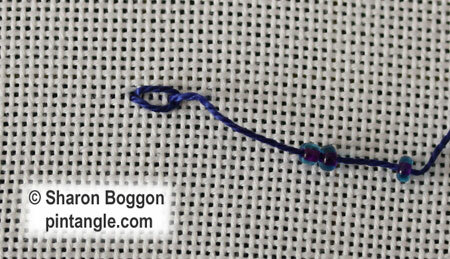 I shared stitch 112 – the feathered chain stitch, and a few of the very first TAST stitches today. I hope to have 113 – 115 done by next week. Thank you for sharing such lovely stitches with us! It will be fun to play around with this stitch! Thank you for all the clear pictures and instructions.